What American isn’t familiar with the story of the Pilgrims? Well, I think MANY Americans don’t know the whole story, and some people nowadays talk as if it’s nothing but a legend or exaggeration of what really happened. Of Plymouth Plantation is an account that should be required reading in every American high school, as well as one that every American Christian should be familiar with. There are only two primary sources which give firsthand accounts of the landing of the Pilgrims and the first Thanksgiving: Bradford’s History (written in 1647) and Mourt’s Relation , attributed to Edward Winslow (published in 1622). Mourt’s Relation (named after the publisher) describes only the events of the first year, from the landing at Cape Cod in November 1620 until the following November. 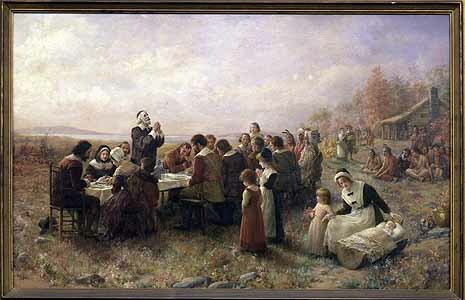 It’s interesting to look at this comparison of the two accounts we have of the first Thanksgiving at Plymouth.William Bradford became the governor of the Plymouth Colony after the first governor, John Carver, died the first winter, and he was the governor for 30 of his remaining 37 years at Plymouth. Bradford’s narrative is much more extensive than Winslow’s, taking us back to when the band of Non-conformist English believers first decide to take the journey across the Atlantic (and no, it wasn’t for a vacation – I hear that’s actually what some people believe!). Since it was illegal in England to attend any church except the “king’s church,” a small group of Separatists held secret worship meetings at different times and locations, and finally moved to Holland. Bradford was about 17 years old when he moved to Holland with the Separatists in 1607. In his narrative, Bradford describes the persecution and loss they suffered for their beliefs in England, their decision and plans to leave England, and the problems they encountered while trying to get to Holland. In England, they experienced loss of property and imprisonment because of their refusal to compromise their beliefs. On one occasion when they had arranged for transportation to Holland, they were betrayed and arrested. Another time, while preparing to leave England, the captain of the ship fled with the men on board who were loading their possessions, leaving their women and children behind on shore in the hands of soldiers. Next Bradford relates the challenges they faced for the 12 years that they lived in Holland, which led to their decision to come to America. He then describes the voyage to and arrival in Massachusetts, the establishment of their colony, their relationship with the local Wampanoag people and the peace treaty they formed, and their struggles to survive in the new land, covering the first 26 years of the Pilgrims in Plymouth. Being thus constrained to leave their native soil and country, their lands and livings, and all their friends and familiar acquaintance, it was much, and thought marvelous by many… But these things did not dismay them (though they did sometimes trouble them) for their desires were set on the ways of God, and to enjoy His ordinances; but they rested on His providence, and knew whom they had believed. Again, in the discussion about moving to America, many fears and objections were raised, but they truly believed they were doing what God was calling them to do and that His blessing would be with them. It was granted the dangers were great, but not desperate; the difficulties were many, but not invincible. For though there were many of them likely, yet they were not certain; it might be sundry of the things feared might never befall; others by provident care and the use of good means, might in a great measure be prevented; and all of them, through the help of God, by fortitude and patience, might either be borne or overcome. True it was that such attempts were not to be made and undertaken without good ground and reason; not rashly or lightly as many have done for curiosity or hope of gain, etc. But their condition was not ordinary; their ends were good and honourable; their calling lawful and urgent; and therefore they might expect the blessing of God in their proceeding. Yea, though they should lose their lives in this action, yet might they have comfort in the same, and their endeavors would be honourable. In this next incident related by Bradford, we see the Pilgrims’ attitude toward persecution. On many occasions, such as this one, they patiently endured mistreatment and mocking, and trusted God to deal with their enemies as He saw fit. And I may not omit here a special work of God’s providence. There was a proud and very profane young man, one of the sea-men, of a lusty, able body, which made him the more haughty; he would always be condemning the poor people in their sickness, and cursing them daily with grievous execrations, and did not let to tell them that he hoped to help to cast half of them overboard before they came to their journey’s end, and to make merry with what they had; and if he were by any gently reproved, he would curse and swear most bitterly. But it pleased God before they came half seas over, to smite this young man with a grievous disease, of which he died in a desperate manner, and so was himself the first that was thrown overboard. Thus his curses lit on his own head; and it was an astonishment to all his fellows, for they noted it to be the just hand of God upon him. But they gathered up their spirits, and the Lord so helped them, whose work they had in hand, as now when they were at lowest they began to rise again, and being stripped in a manner of all human helps and hopes, He brought things about otherwise in His divine providence, as they were not only upheld and sustained, but their proceedings both honoured and imitated by others. Towards the end of his narrative, Bradford writes some words of remembrance regarding the death of their pastor, William Brewster, in 1643. He then goes on to observe the amazing fact that many of the Pilgrims enjoyed a long life, in spite of all the trials, difficulties and hardships they endured. On many occasions, this group of believers could have abandoned their plans or given up hope of success. But God’s hand of protection, provision and direction can be seen as they continued to trust Him. William Bradford believed that by telling their story, many would see the working of God and would trust Him to work in their lives as well. All to the glory of His name! If you’ve never read the original Pilgrim story written by William Bradford, I recommend you read at least the first half which would get you to about the year 1625. An E-book is available for free at Project Gutenberg, and a more readable version has been published by Random House’s Modern Library, 1981. This entry was posted in Christian Books, History & Biography, Non-Fiction and tagged American history, Pilgrims, Plimoth Plantation, Plymouth, providence, Separatists, Thanksgiving, William Bradford. Bookmark the permalink. I really enjoyed reading this! It brought back many pleasant memories from when we studied the pilgrims growing up. It’s always good to hear about the faithfulness of God in the lives of other believers! You’re welcome. I’m glad you found the review helpful and thanks for sharing it! I will be checking out your blog.